On Monday, Mishaya 28 aged dominant Silverback who had lived only half of his life in Bwindi Impenetrable National Park, died after a short illness. His death was announced by the top wildlife officials after a thorough examination. According to the director of conservation through the public health, Dr Gladys Kalema, the lifespan of a protected mountain gorilla is about 50 years. She went on and said that Mishaya has been an active, sensitive and friendly gorilla who broke away from Nshongi about 2 years ago. “Mishaya will be missed’, Kalema said. Others who eulogized Mishaya pointed out that he would give tourists a compelling opportunity for photographs and would amuse them. The executive director of Uganda wildlife Authority (UWA), Dr. Andrew Seguya said that the country has lost a lovely mountain gorilla which was free with tourists. In order to avoid more deaths, he has sent veterinary doctors to investigate further what caused Mishaya’s death. According to the recently concluded results, they indicate that Mishaya died after the coiling of the intestines. Mishaya was the only alpha male (silverback) after which a group of habituated gorillas in Bwindi Impenetrable Forest was named. He has been living in a group called Rushaga which is found in the southern region of Bwindi. This southern sector of Bwindi has other habituation of gorillas which include Kahungye group, Busingye group and Nshongyi group. Rushegura Group-Buhoma side: Has 21 members including the dominant silverback,Black-back,2 sub-Adult,5 adult females,6 infants and 6 juveniles. Mubare Group – Buhoma side: Has 5 members including the dominant silverback,1 adult female,1 black-back and 2 juveniles. Habinyanja Group – Buhoma area: Has 17 members including 1 dominant silverback,3 sub-adults,5 adult females,6 infants and 2 juveniles. Nkuringo Group – Kisoro side: Has 17 members including 1 dominant silverback,3 black-backs,3 sub-silverbacks,3 juveniles,3 adult females and 4 infants. Oruzogo Group – Ruhijha area ; Has 23 members including 1 dominant siverback,5 black-backs,1 sub-siverback,7 adult females,4 juveniles and 5 infants. Bitukura Group – Ruhijha area: Has 13 members including 1 dominant silverback,3 black-backs,3 sub-silverbacks,3 adult females,3 infants and 1 juveniles. 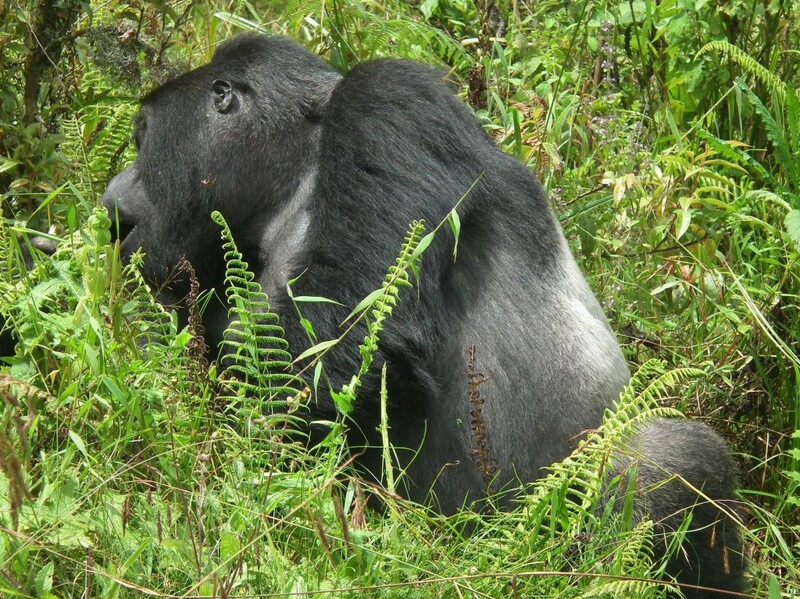 Kahungye Group – Kisoro side: Has 24 members including 1 dominant silverback,2 sub-silverbacks,4 adult females,3 black-backs,3 sub-adults,7 juveniles and 4 infants. Mishaya Group – Kisoro side: Had 7members including 1 dominant silverback (which died last Monday), 2 adult females, 1sub-adult and 3 infants. Nshongi Group – Kisoro side: Has 21 members including 1 dominant silverback,3 Black-backs,2 sub-silverbacks,6 adult females,3 infants and 6 Juveniles. However, a visitor is required to obtain a gorilla permit before he/she is allowed to track the gorilla. These gorilla permits are issued by Uganda Wildlife Authority (UWA), at their offices in Kamwokya. Alternatively, gorilla permits can be purchased online by visitors intending to track the gorillas in Uganda. Gorilla tracking in Uganda costs US$600 per person (per day). Apart from Bwindi Impenetrable National Park, gorillas are also found in Mgahinga National Park.